INDIANAPOLIS, INDIANA – INDIANAPOLIS – the 2019 Monster Energy AMA Supercross Championship heads to the Lucas Oil Stadium this weekend and the competition on the dirt will be intense as the sport’s leading lights duke it out for the win.Indianapolis is the home of US racing, and in recognition of the city’s prominent role in motorsports, Alpinestars has released the Limited Edition ‘Indianapolis’ Tech 10 boot. 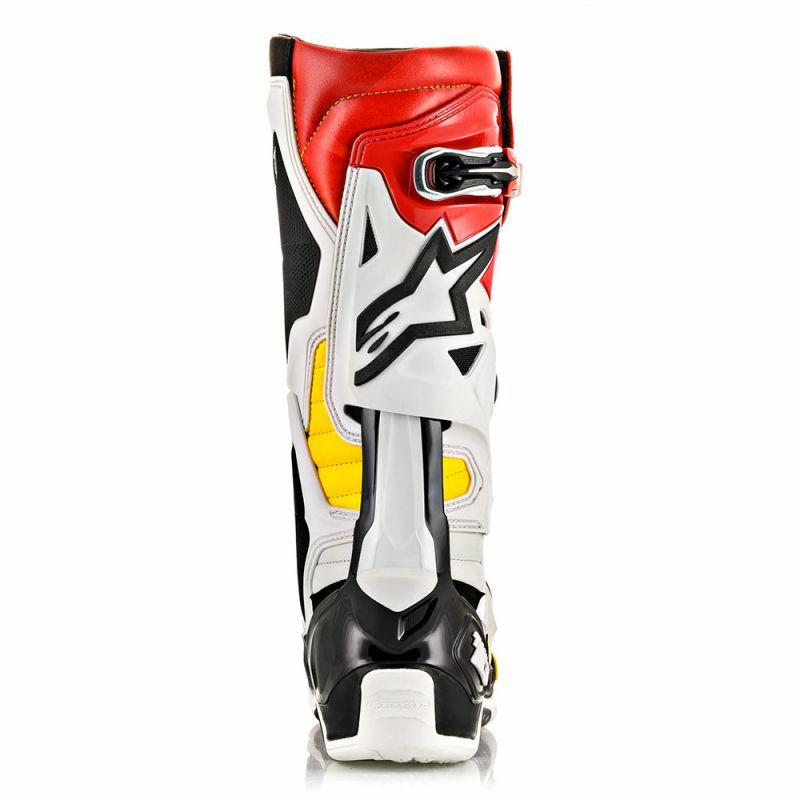 Inspired by the flame detailing of classic American hot rods, the boot features a distinctive black, metallic red and yellow red color scheme.The CE certified Tech 10 is a technologically advanced and protective boot that incorporates innovative materials in a streamlined design for a lighter, more anatomically profiled performance. The ‘Indianapolis’ blends all of the technological properties of the Tech 10 in a striking colorway, as worn by all of the Eli Tomac, Marvin Musquin, Cooper Webb, Justin Barcia and all of the Alpinestars riders at the meeting, allowing Supercross fans to wear the same boots as their racing heroes.The Tech 10 has set the standard for Motocross boot performance and protection for well over a decade and for summer 2018 the completely re-designed Tech 10 boot raises the performance envelope even further. 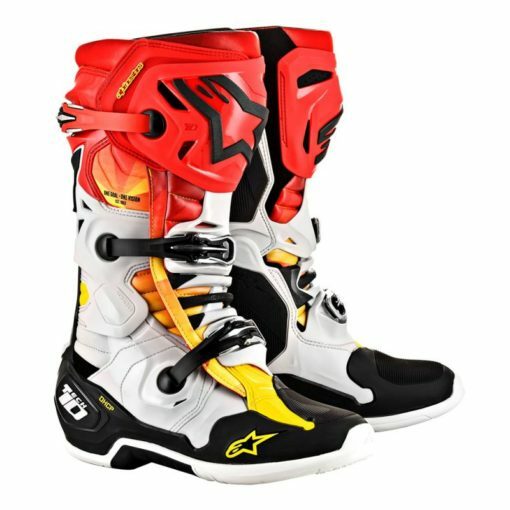 Perfection through innovation; while maintaining the iconic Tech 10 look, the new boot represents an entirely new approach – improving its ability to give a rider the ultimate in feel, comfort and safety.The Tech 10’s re-design (2019 Model) has been guided by three priorities as the Alpinestars technical footwear development team looked to improve overall functionality, performance and safety, decrease weight and reduce material volume. 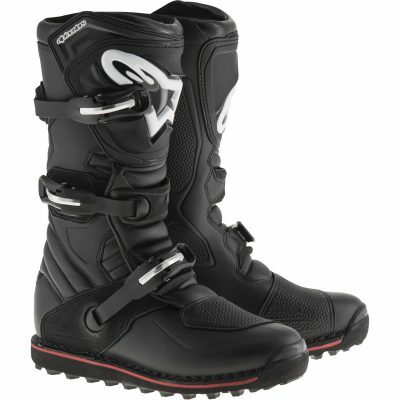 Maximizing these priorities is the key achievement of the new Tech 10 and the result is an all new boot with a greater range of movement and flexibility while offering better control over the flexion and torsion forces that significantly improve boot performance, giving the rider greater confidence and protection.• Enhanced Functionality, Performance and Safety:The Tech 10’s comfort is legendary and a key feature in making the boot a pleasure to wear in all conditions. 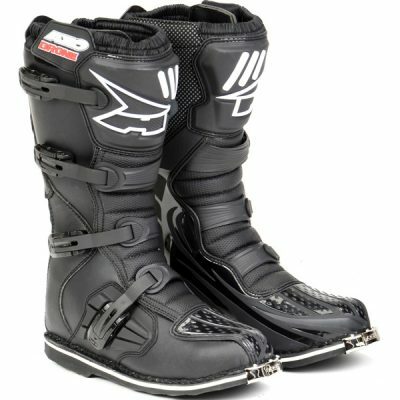 A key objective was maintaining the boot’s feel while enhancing its performance, functionality and safety. 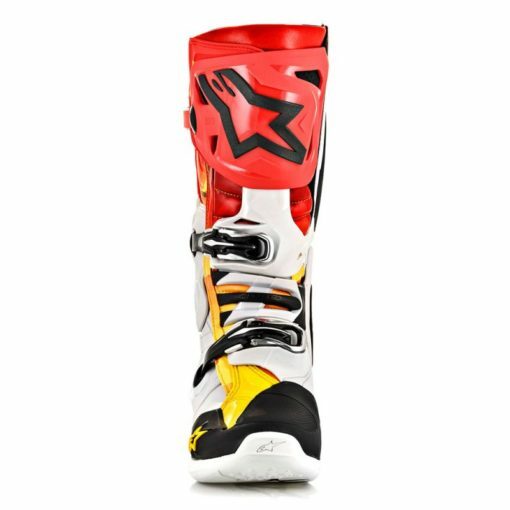 The most significant upgrades to the Tech 10 performance are unique technologies: The Frontal Flexion Control Frame, the Asymmetrical Dual-pivot Arms, the patented Dynamic Heel Compression Protection Shock Absorber which is integrated into a redesigned foot shell and the slimmer, more streamlined, outsole.• Reduced Weight:The Tech 10 is lighter, a result of Alpinestars technicians studying all the boot components and their connections – how the boot comes together. A re-design of every single one of those components has been undertaken to reduce volume and weight.New material composites have been created that are lighter in weight and more durable to ensure they hold up to the rigors of off-road riding. The new, cold-forged, aluminum buckles are a result with an easier to operate, more durable and self-aligning closure that offer a positive hold across the upper surfaces of the boot. The result has yielded over 400 grams (almost 1lb) in weight reduction for the new Tech 10.• Reduced Material VolumeThe design also reduces the Tech 10’s profile and physical size. It is more streamlined with newer, lighter, more durable composite materials and a more integrated approach to the construction of the components which dynamically enhance the chassis of the boot and utilize more advanced bonding processes.• DCHP – Unique Heel Protection InnovationBuilt into the Tech 10’s unique and lightweight single-piece co-injected foot chassis is the patented Dynamic Heel Compression Protector (DHCP), an innovative safety feature which includes a fully integrated collapsible heel area with expanded poly-foam to absorb high impact energies during a crash. DCHP features a directional impact protection system which significantly reduces the effect of excessive, potentially injury-causing, energy being transferred to the ankle and lower leg. DHCP has been used by Alpinestars athletes in the demanding environments of professional Supercross and Motocross. • The Tech 10 chassis combines advanced lightweight microfiber and impact and abrasion resistant TPU shell. • Foot shell features five different compounds in a single lightweight piece to offer strength while maintaining flexibility and structural integrity. Foot shell incorporates heel and toe protection that is highly resistant to abrasion and impact and adds to the boot’s overall durability. Foot shell also includes integrated shank for support and structural integrity. • Frontal protection features a dual closure system with an internal microfiber flap, plus hook and loop fasteners for a precise fit closure beneath the buckle giving greater, micro-adjustable, precision which is convenient to operate. Soft microfiber gaiter helps seal out excessive water and dirt entry. 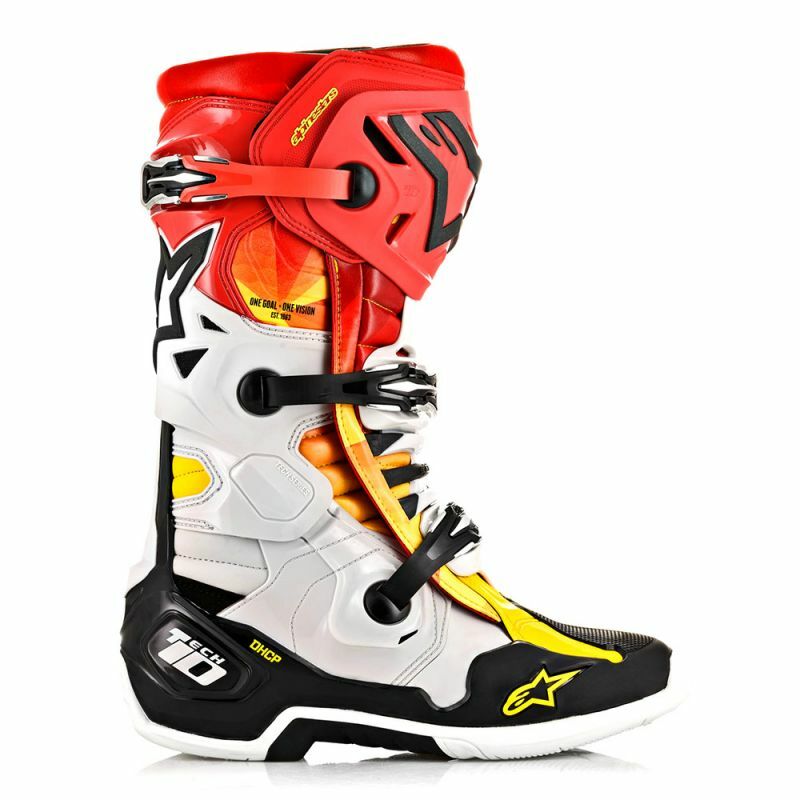 • Built into the Tech 10’s unique and lightweight single-piece co-injected foot chassis is the patented Dynamic Heel Compression Protector (DHCP), an innovative safety feature which includes a fully integrated collapsible heel area with expanded poly-foam to absorb high impact energies during a crash. DCHP features a directional impact protection system which significantly reduces the effect of excessive, potentially injury-causing, energy being transferred to the ankle and lower leg. DHCP has been used by Alpinestars athletes in the demanding environments of professional Supercross and Motocross. 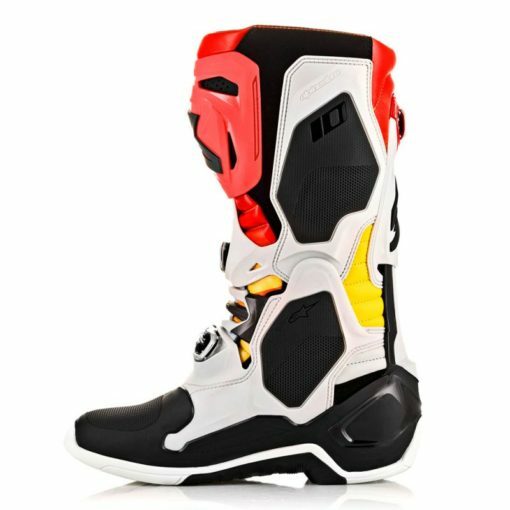 • The Tech 10 design is slimmer and more streamlined with a contoured calf protector ergonomically wrapping around the rear leg. Constructed from a dual density compound and combined with the rear blade system, protection is enhanced with progressive dampening of excessive torsional forces. The energy dissipating shin plate features a new anatomic design for reduced surface area and weight-saving. • Anatomically optimized re-designed for weight-saving and ergonomics, the new triple buckle closure system features a nylon and fiberglass compound for improved durability and strength. New slim-line buckles include high-impact bridge closures which are cold forged for precision and strength. The closure system features contra-closure, doubling closure security and a quick release/locking system with self-aligning, memory, design for easy, precise closure and improved riding performance and security. All buckles are easily replaceable. • Lighter, anatomically redesigned medial and lateral torsion arms which are compact and offer increased range of movement and control. 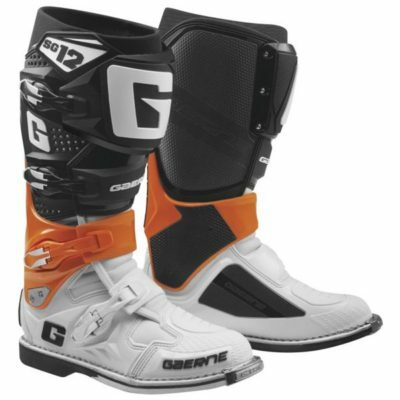 In conjunction with the outer boot chassis, the ankle brace gives vertical and lateral protection from ankle and leg compression and rotation and progressive damping of torsional forces during an accident, while still allowing natural freedom of movement. • Double pivot system allows the Tech 10 to retain its integrity while flexing which removes the need for alternative torsion bars for varying ankle widths and crucially gives the essential progressive resistance to rotational and vertical forces which, otherwise, are so damaging to ankles, knees, upper legs and pelvis if not arrested in a controlled way. • increased sensitivity and control.